During his lifetime, renowned artist, dancer, didgeridoo player and storyteller, Paddy Fordham Wainburranga embodied the living history of the people of Australia’s far north. Born in the bush at Bumdubu, near Bulman, north east of Katherine, Paddy was brought up under the traditional tutelage of his father and uncles and did not encounter non-Aboriginal people until 11 years of age. For more than 20 years he worked as a stockman on cattle stations throughout the far north and later settled in Maningrida, finally returning to Bumdubu and establishing his own outstation during the early 1980’s as the homelands and land rights movements gained in strength along with the growth of the Aboriginal dependence on the welfare system. 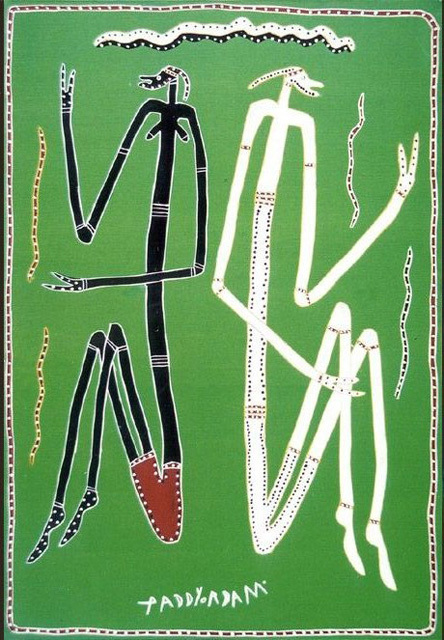 Paddy explored each of these themes and a great many others through paintings and stories thus playing a major role in revealing Aboriginal history from a unique traditional Aboriginal perspective. In time he became the senior elder of the Rembarnga people and divided his time between making artworks and leading the Rembarnga in important ceremonial activities throughout the Northern Territory. Although taught traditional painting by his father, Paddy Fordham did not begin to make art seriously until the early 1970’s. He was instrumental in helping to establish Mimi Arts and Crafts and later created many of his finest works while working with Glen Bird who encouraged him to concentrate on major thematic works. Some great examples of these were exhibited at Coo-ee Aboriginal Art Gallery in Sydney during the late 1980’s and early 1990’s and sold to collections as diverse as the National Museum of Australia, The National Maritime Museum, the Australian War Memorial and the National Gallery of Australia. These large barks and works on paper included magnificent narrative paintings entitled Too Many Captain Cooks, The Coming of the Welfare System, World War II Supply Ships, How World War II Began, Macassan Traders, the Kinship and Payback System, and The Structure of Traditional Aboriginal Society. Paddy Fordham Wainburranga was a major contributor to the 1988 Aboriginal Memorial now housed in the National Gallery of Australia. He created 30 of the 200 hollow log coffins made to commemorate Aboriginal deaths since colonization. Despite being best known for his history paintings, his most enduring contribution to Australian art, and the preservation of Aboriginal culture, are his large narrative depictions of traditional Rembarnga myths and legends created on bark and Arches paper and carved in to wood. These included those of the powerful and wise Balangjalngalan Spirits, Gurrdunyu the Moon Man, Waditj the Rock Man, Gollomomo the Crocodile Man, Kollo Kollo the Left Handed Man, and many many others. During his lifetime Paddy’s works were included in landmark exhibitions in Australia, the UK, USA and Germany and were the subject of several films, biographies and books. In 1989 he won the award for the best artwork in open media and in 1993, was awarded first prize in the National Aboriginal Art Award offered by the Northern Territory Museum of Arts and Sciences, Darwin. Paddy’s sculptural depictions of Balangjalngalan Spirits occupy three of his highest five results at auction. His secondary market record was achieved at Lawson~Menzies in November 2007 when a series of six large barks sold for $55,200. These depicted The Payback System, Balangnangalang, Kinship, the Chicken Hawk and the Python, and Marriage. His works have a very high 72% success rate at auction and his average price of $4,270 is good considering the high proportion of sculptural pieces, works on paper and canvases that have been offered by an artist principally noted for paintings on bark. Of the 24 sculptures offered 22 have sold at an average price of $3,799 while the 5 works on paper that have been successful at auction have averaged $1,331 in value. During the later part of his life Paddy gave up painting major thematic works, and showed a preference for simpler, less cluttered imagery that appealed to the many visitors to the Katherine area where his work was featured as a mural on the outer walls of the Tourist Information Centre. He became the unofficial Aboriginal Ambassador of the region introducing visitors to the didgeridoo and delighting them with his stories related with good humour and raffish charm. The work illustrated here depicts a married couple in the pared back highly contrasting style typical of the works on canvas that he preferred to create during this later period. The couple, Balang and Narditjan, are wed both physically and spiritually. After death Balang will be transformed in to his totem the butterfly, and Marditjan will become a beetle. The work was painted in 2002 just 4 years prior to his death.